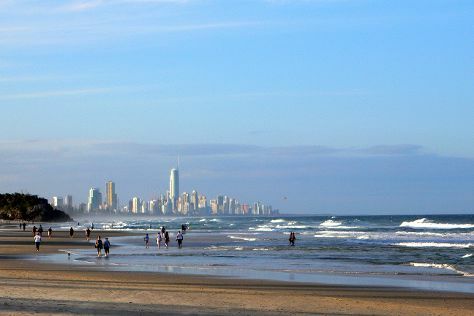 Eschew the tourist crowds and head to Burleigh Heads Beach and Mooloolaba Beach. Change things up with these side-trips from Brisbane: Slideways - Go Karting Gold Coast (in Nerang), Coolangatta Beach (in Coolangatta) and SkyPoint Climb (in Surfers Paradise). Spend the 9th (Sat) with some fine spirits on a distillery tour. Next up on the itinerary: admire the natural beauty at City Botanic Gardens, have some family-friendly fun at Psychic Readings | Twin Featherz, identify plant and animal life at Lone Pine Koala Sanctuary, and enjoy the sand and surf at Burleigh Head National Park. To see photos, other places to visit, reviews, and tourist information, read our Brisbane road trip planning site . Shanghai, China to Brisbane is an approximately 15.5-hour flight. You can also do a combination of bus and flight. Due to the time zone difference, you'll lose 2 hours traveling from Shanghai to Brisbane. Plan for much warmer temperatures traveling from Shanghai in February, with highs in Brisbane at 33°C and lows at 24°C. Wrap up your sightseeing on the 9th (Sat) early enough to travel to Cairns. You'll explore the less-touristy side of things at Balloon Rides and Cairns Cenotaph. Spend the 11th (Mon) among aquatic life with a scuba or snorkeling tour. Spend the 12th (Tue) wandering through the wild on a nature and wildlife tour. The adventure continues: let the kids burn off some steam at Muddy's Playground, kick back and relax at Trinity Beach, and stop by Australian Leather Company. To find traveler tips, maps, and more tourist information, read our Cairns vacation planner. Fly from Brisbane to Cairns in 5.5 hours. Alternatively, you can do a combination of bus and flight; or drive. Traveling from Brisbane in February, expect somewhat warmer with lows of 28°C in Cairns. Wrap up your sightseeing by early afternoon on the 13th (Wed) to allow time for travel back home.